The goal of our Senior Nutrition Program is to support the independence and well-being of our seniors through nutritious, healthful and tasty meals; and through education aimed at helping seniors make the best dietary choices for their health. We have two programs to help meet this goal Home-Delivered Meals (often referred to as Meals-On-Wheels) and Senior Lunch Sites. Catholic Community Services’ Home Delivered Meals Program offers frozen home delivered meals for older persons who are unable to leave their home to shop and find it hard to prepare nutritious meals. 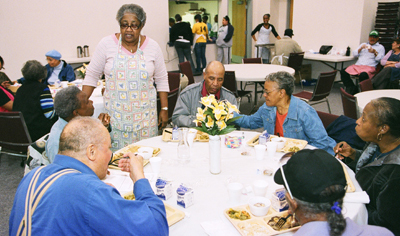 The meals are prepared with the special dietary needs of seniors in mind. All meals are certified by a Registered Dietitian to meet 1/3rd of the RDA. After discussing your needs we can determine your delivery day, mail you a menu and get your meals started. You can look forward to a reliable friendly driver visiting you once a week with your meals. The office staff will be happy to help if you need information about other services that may be available to you. Call us at 253-474-1300 in Pierce County or 1-888-976-0712 in Lewis County. To see the eligibility criteria and more information, click here. Volunteers are the lifeblood of the Senior Lunch Site program. To volunteer at a site near you, please contact the office at 253-474-1200. Every $5 donated allows us to provide one more meal to a homebound senior or one more meal at a senior lunch site. To donate, please click here, or the button below.